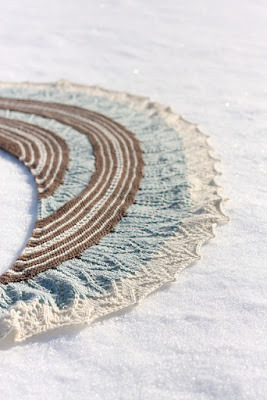 Recently, our Lhasa Wilderness yarn was used in a gorgeous shawl design by Simone Kereit of Owl Cat Designs: the Khyber Pass Shawl uses three colors of our yak and bamboo blend yarn (shown here in Sassenach, Jacobite and Skye) to create a stunning finished project. The pattern is part of the Silk Road 2016 Shawl Club: Wayfarer, which is geared towards knitters looking for projects which will help them build skills throughout its duration. We hope you enjoy getting to know Simone just a little bit better by reading the interview below. It's not too late to join the shawl club (click here for more details on the Owl Cat Designs website), and you can save 15% on your yarn order for the Khyber Pass shawl in our online store when you enter KHYBERPASS at checkout. 1. When did you learn to knit? I learned to knit when I was about 5 or 6. My Mom always had a knitting project going, but at some point we also learned it in elementary school, which is pretty standard in Switzerland. But I think I kept up with it (with breaks for busy school years and the like) because I liked the creative aspect of it, and also because my Mom knit and it kept it in the forefront of my mind. Ahh well, I think I sort of learned that way when I started, you know? It was just the way sweaters where 'done' most of the time back then, at least where I am from. You went to the yarn store with an idea, found a yarn you liked, swatched, then did the math. After moving to the US I started realizing that the sweaters I knit and my process were quite different from most any knitters I met here. Patterns for entire sweaters had not been something I had used frequently. As a kid, no one was going to spend the money on getting you a proper pattern, and there were probably not that many kid/teenage patterns at that time either. My mom would every so often get a kit from a yarn magazine, for an entire cardigan or sweater, but regular wool from the store would be good enough for the teenager! And after knitting several designs from patterns in books and magazines and having to alter them for fit anyway, not to mention teaching others about sweater construction, it sort of was a natural transition to going into designing as a business. 3. Are there other crafts you like to do in addition to knitting? I studied languages as well as art, and so tremendously enjoy watercolor painting and just sketching with plain old pencils, though I have neglected all of that for the last few years in favor of more knitting time. If you are looking at the other fiber arts, I do have a spinning wheel and though I am no expert and know practically none of the lingo as I am self taught, I do like to spin for relaxation and have a stash of lovely handspun yarn that I keep looking at and wondering what project would be pretty enough to make with it. So for now, I mostly decorate with the yarn, it lives in a pretty basket in the living room! 4. 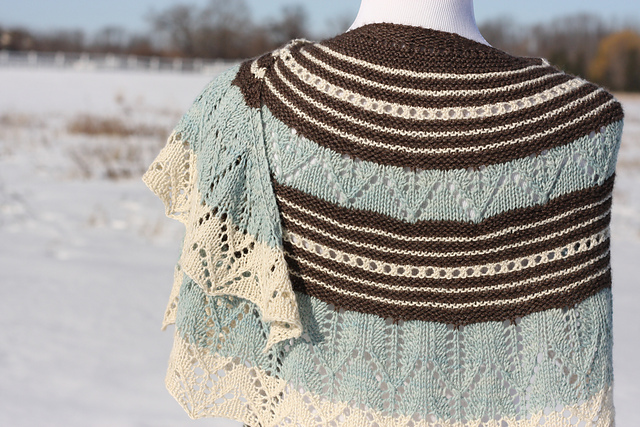 What was your process for designing the Khyber Pass shawl? Oh this could be a really long answer, but I'll try to make it short! 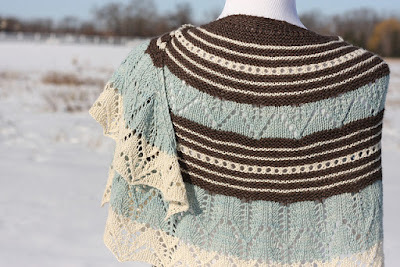 Khyber Pass is the first shawl from my themed shawl club. What I am doing this year is a bit different, and new. The theme this year is 'Silk Road' and I actually am running 2 separate 'paths' one can travel on the Silk Road, the 'Wayfarer' and the 'Explorer' path. 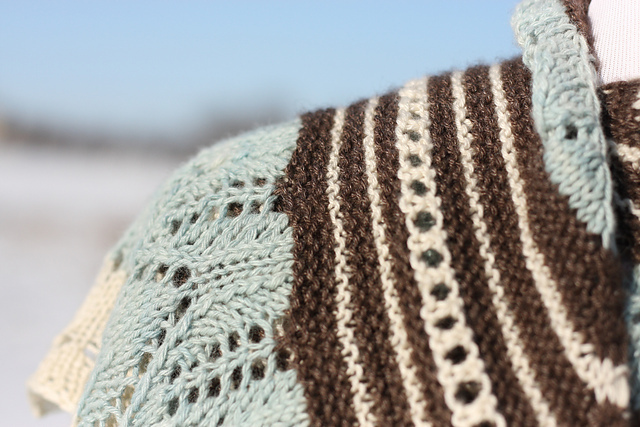 Khyber Pass is from the Wayfarer path, which will have smaller shawls and cowlettes, designs that are perhaps a bit more relaxing and laid back to knit, (so no WS lace rows or anything crazy!) and all these patterns will be written as well as charted. Wayfarer also comes with built in teaching modules specific to the Wayfarer shawls, so that the club members can upskill as they work through the shawls and cowlettes, a forum on my website, and an exclusive 10% discount on any pattern or e-book for the year. So the inspiration behind this shawl was a high mountain pass along the historic Silk Road. Travel back then would have been hard work, slow and most places probably pretty dusty. I wanted the shawl to have parts that showed the rocky trail or dirt road that leads up to the pass. And I wanted to have some lace, to show the contrast of snow fields and glaciers on mountain tops to the dry dirt road and rock dominated landscape below. Then there is a bunch of swatching and math, lots of math. 5. Do you have any stories about knitting/designing mishaps? Well, yes, I don't think I would be where I am at without those! The more you make mistakes and fix them, the better you get at it all, I can fix a whole lot of knitting mishaps at this point! But yes, there is one specific shawl that comes to mind (it's not yet out so I don't have a name I can give you) where I knit about 600 yards into the design I had written and realized there was no way I would have enough yarn to complete the shawl the way I had intended and keep it looking congruent with the inspiration behind it, so I had to frog back the entire shawl, all 600 yards of it, and start over. Luckily, I really loved the yarn so I was happy to get to work with it for longer! 6. What are your best tips for knitting shawls? Lace? Using multiple colors of yarn? If you are newer to knitting shawls, I think the best advice for lace or lace section is to use life lines, they can truly be such a time saver and even if you don't ever end up using them, it's often going to be a much more relaxing knit, because you will know that should something go wrong, you can just drop back a few rows, and all your stitches will still be there! When you are working stripes, like the garter stripes on Khyber Pass, carry the unused yarn up the side, but one or two stitches in from the edge. This makes it look a lot nicer and neater. I usually do this on the WS row: work to the last stitch, twist the two yarns around each other on the back of your work, then work the last stitch. Also, I think spit splicing (a technique where the ends of yarn are felted together so as not to have to darn them in later) has changed my life! I have a totally different outlook on multi color designs. If you are not familiar with the technique, look it up, it's so easy to do and totally worth it! And with a bit of extra effort, it even works on a good number of superwash wools! Oh and one more: don't knit late at night when you are tired! Simone Kereit grew up in Switzerland where she learned to knit around age five. Her designs have been featured in print and online, in books and magazines and she has designed for or collaborated with various yarn companies, and worked with exclusive yarn clubs.She is the author of several knitting pattern books such as over mossy stones..., Karyai, and her latest collection, Five Fathoms, which was released in German as well as English. She brings her enthusiasm for the creativity of yarn and her love for teaching to all her workshops and classes, while her passion for fine arts and her ability to speak several languages have helped her understand and relate to students of varying levels of expertise.